If you want a GH1 you want this, editing software! Now you can download the latest version of th Panasonic editing programm which can handle the Panasonic GH1 footage (from the japanese Panasonic website). FINALLY, do you like the new design? There are small things we will fix during the day. It is is still a prerelease so write us if you have better ideas. Thanks to the guy who posted this link in the comment section. today we are going to work on our website design. Probably you will experience some strange layout changes and may some displaying error. We hope to finish our job in 12-14 hours. For people who is waiting for new rumors we can anticipate you that next week we will reveal the name of the new Olympus micro four thirds camera. We have an update for Panasonic and Leica users over their micro four thirds golas. We are gonna to publish this news quickly after the final website checkup. Panasonic GH1 unboxing! And first video! At flickr you can find the first unboxing ceremony. When you have finished go to see the first example video made with the GH1. Finally analyse this ISO 3200 shots. (FT 3) BIG! Panasonic and Leica to produce together a new compact m4/3 camera? So Panasonic folks. We have something for you. In the last week we received some informations from two sources who gave us some news over Panasonic and Leica micro four thirds plan. 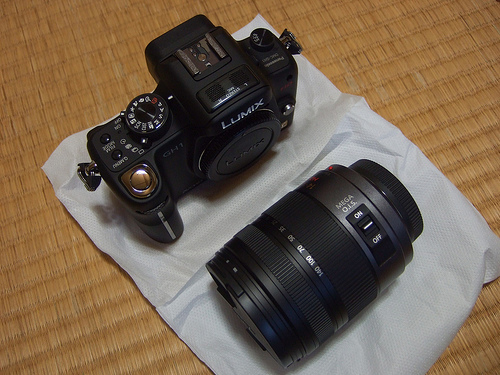 That’s what we got and to bo honest this are the first Panasonic rumors we publish with (FT3) value. FT3 means that is not only a cheap rumor! 1) We from 43rumors are sure a Panasonic compact mico four thirds camera will come before the end of this year but what really surprises us is tht this will probably be made in collaboration with Leica. It seems they were cheating us on point “a” ;) May Panasonic has convinced Leica to enter in the micro for thirds market. It seems wise for Leica to go for m4/3 instead of doing all alone! And the Panasonic and Olympus m4/3 brand will gain a lot of credit having Leica (and his lenses) on board! 4) If Leica enters the micro four thirds world expect to see the release of new Leica lenses specially made for m4/3! It is to early for specs, I don’t have any certain onfromation. May I write a (FT1) post later with specs I got from anonymous people. UPDATE: it is possible that such a camera could be announced this year but we are very doubtful that it will be called “LX5”. Probably it will have a new name. UPDATE 2: Yes, one trusted source told us the compact m4/3 camera will not be the LX5. P.s. : Sunday is webste redesign day. Hope you will enjoy it!